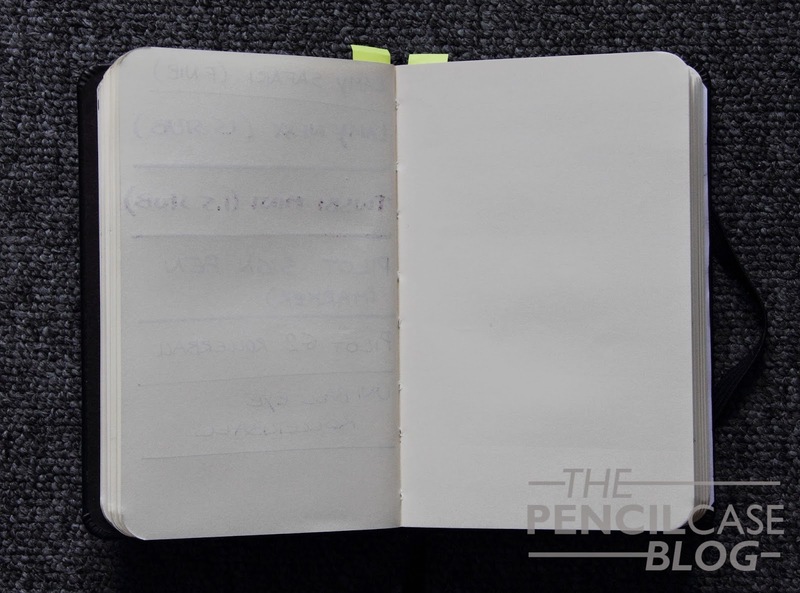 It has been way too long since I last did a proper paper review, so I decided to review one of my all time favourite notebooks: the Rhodia Webnotebook. These notebooks are available in a few sizes (I think A4 all the way through A7, in orange or black cover), mine's A6 sized (same as a field notes notebook) which makes it pretty convenient to take it with you, though it's nowhere near as portable as Field notes or other similar notebooks due to the hardcover design and the thicker profile (96 pages in comparison to 48 on the Field Notes). 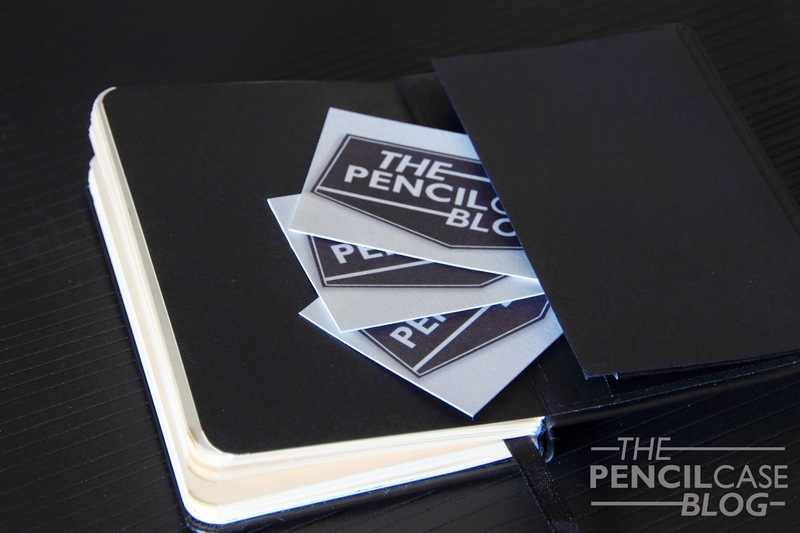 As with most good quality notebooks, you can find a little pocket at the back of the notebook, which is great for holding business cards or other small pieces of paper. I really like the overall look and feel of these notebooks, they're pretty well-made and they have a clean, no-nonsense appearance. 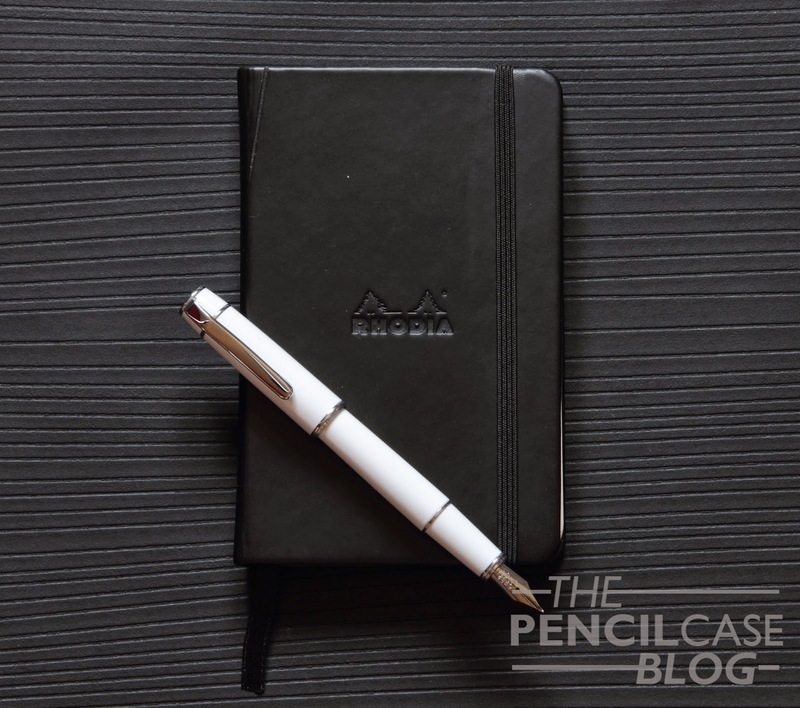 The Rhodia logo is embossed on the front of the leatherette cover, no other branding is to be found in or on the notebook. The only thing I dislike about the design of the webbie is the material they used for the cover, there's kind of a love-hate relationship going on with it. It's very soft and pleasant to hold, but that's about as positive as it gets. For a start, it's supposed to be an Italian leatherette material, but no matter how hard I try, I can't see how this could ever resemble leather! It's more of a soft, rubbery coating, not anywhere near leather-look. 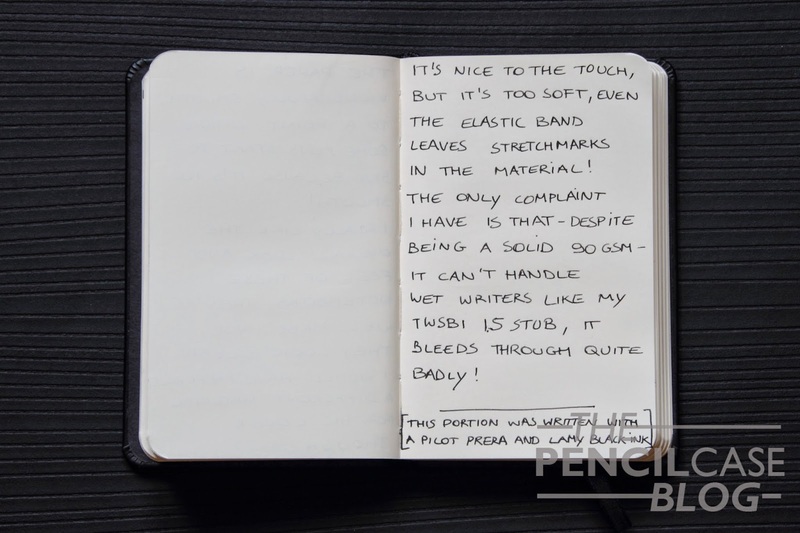 To make things worse, this rubber-like material isn't the most durable, it can handle a substantial amount of abuse, but it seems to be vulnerable to pressure, even the elastic band that closes the cover leaves a permanent mark in the material. Also, as you might be able to see in the very first picture, there's something weird going on in the top left corner of the cover, it looks like the material has ripped or cracked? I have no clue how this happened, for all I know it was already there when I bought it, which is quite unfortunate on a higher-end notebook. Another slight disadvantage is the fact that it won't lay flat, I had to almost rip it apart (seriously, don't bend the spine 360 degrees like I did!) so that I could take proper pictures of it. When in use, I didn't really bother the fact that you have to hold it open. 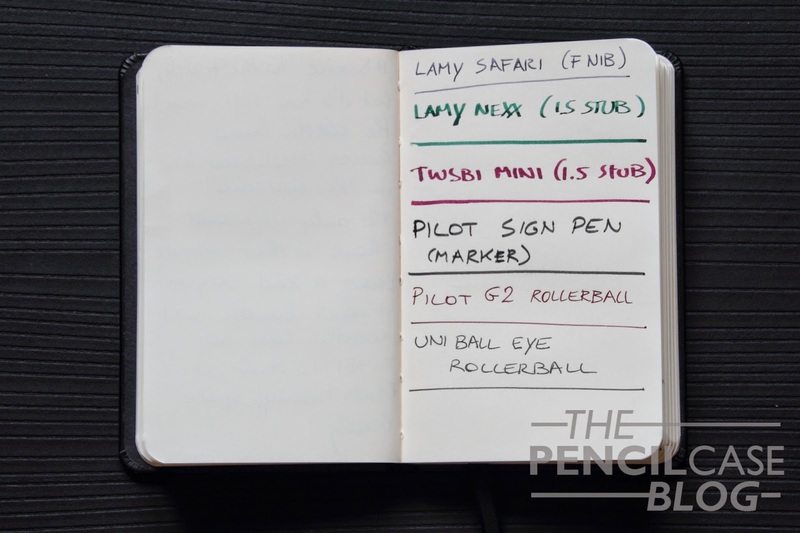 It doesn't really matter on a pocket notebook like this, as you'll probably only use it to write quick notes. 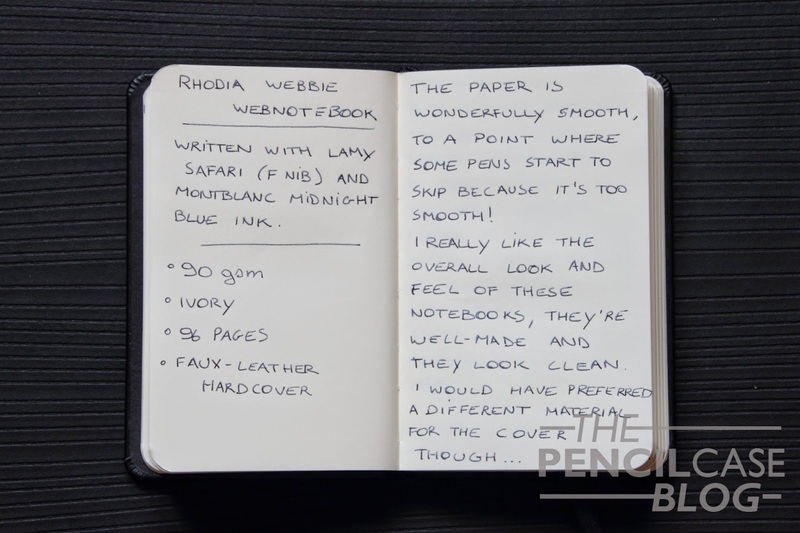 I'm a huge fan of Rhodia paper, I especially love the lined A4 pads I use to write reviews on. For some reason, Rhodia paper is always a tad bit smoother, and I'm glad to say that the paper in this notebook is little or no different! In fact, it is almost too smooth, to a point where some fountain pens, mostly stubs, can have some trouble to get started. Besides the occasional hard start, the 90gsm ivory-colored paper is a joy to write on, it's really smooth with little or no feathering. Unfortunately though, it suffers from a small amount of showthrough on the other side, and in some cases (with wet nibs or markers) even some bleedthrough. I really have no clue why this heavy paper can't handle wet nibs, even the lighter 80gsm paper of the Rhodia notepad outperforms it when it comes to bleedthrough. So is it worth the retail price of around 16 USDollars (The larger sized models are obiously more expensive!)? I think so, yes! 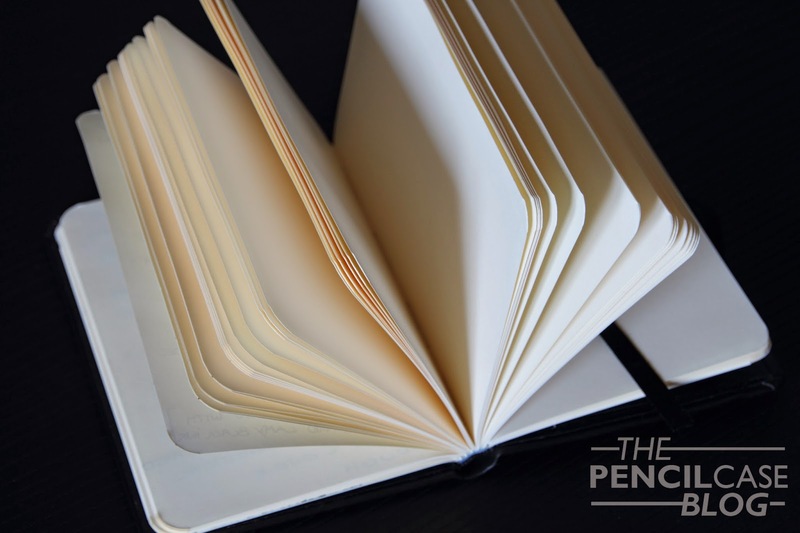 There are a few downsides about it, but if you compare them to Moleskine books -which are a bit cheaper - you'll immediately notice the difference in paper quality. The Rhodia is much smoother, and despite having some showthrough/bleedthrough issues, it is still a lot more fountain pen friendly than your average Moleskine! Thanks for your review. I have the larger A5 sized webbie. It's the first one I've ever tried. I find that it actually does lay flat. 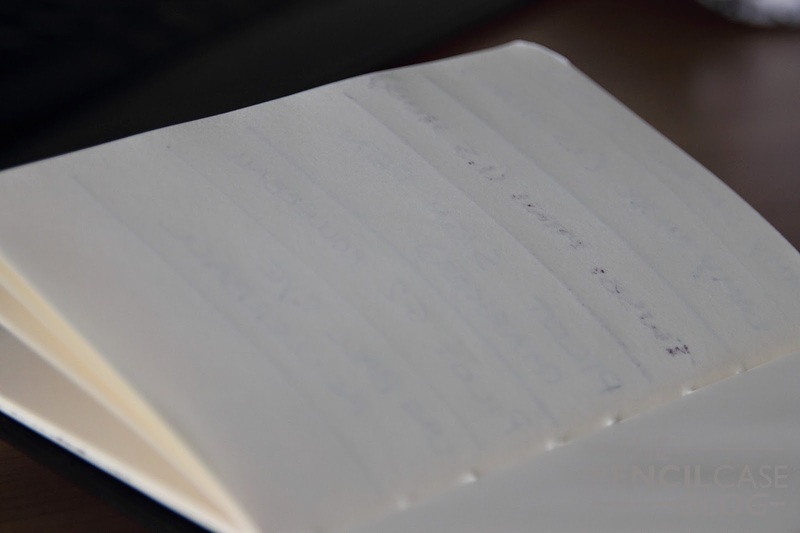 I use mine as a Commonplace book and journal. So I paste in a lot of ephemera, such as newspaper clippings, printed photos, etc. 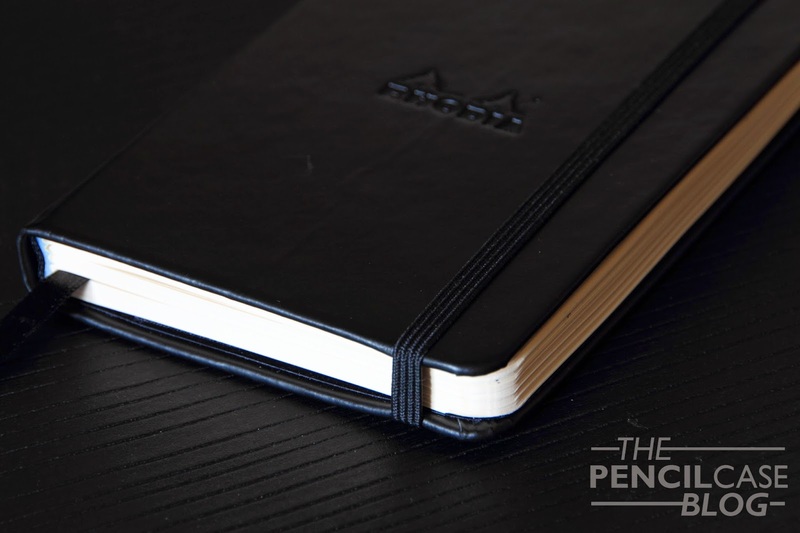 It holds up to the overstretching of the binding better than Moleskine. Thanks Kate! Good to know that the larger ones behave better! They do indeed withstand a lot of abuse, I literally bent it 360 degrees, page by page, and it is still alive. The bindings have loosened up a bit, but at least now it lays reasonably flat!